Automator, the suite of automation tools for OS X that can create user workflows, services or apps, has received a series of interesting improvements in Lion, some of them useful additions that will likely eliminate the need for certain kinds of third-party software for many users. In spite of Lion being described as a "user-friendly" OS thanks to the implementation of gestures or full-screen apps, as we've seen in our review and other articles following the Mac App Store launch it's clear there's still much room for tweaking and "taking control" of the OS when you want to get the most out of it. Take the Option key for example: Option has been capable of reversing certain behaviors in Mac apps for quite some time, but in Lion it gets a whole new usage as it can reverse the entire Resume system, show the Library in the Finder's menubar, or change the Finder's "Arrange By" feature to "Sort By". And that's just the Option key. Personally, I disagree on the assumption that Apple is "dumbing down" the operating system only by introducing functionalities that make interacting with a computer easier. The way I see it, Lion is the most powerful and feature-rich version of OS X to date (and several developers, from a technical standpoint, agree with this) and, actually, the gestures themselves can appease any power user when correctly mastered. Lion may look simpler on the surface (and to an extent, I can see why the addition of the Launchpad doesn't help as far as this argument goes), but it's a very powerful entry in the OS X family once you take a peek under the hood. For this reason, the fact that Automator -- historically the system tool for power users -- has gained nice additions in Lion doesn't surprise me. And yet again, the degree of the new features implemented by Apple in Automator manage to intrigue the curiosity of a geek who's always looking for new ways to automate his Mac. 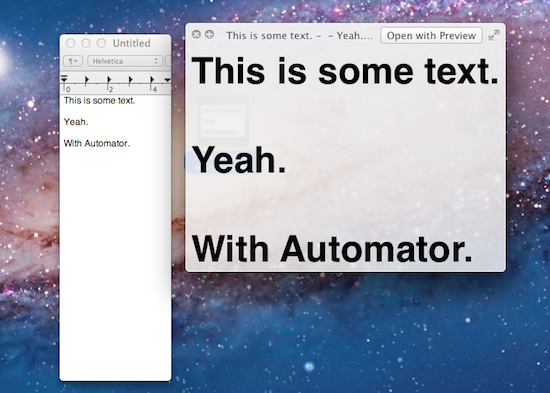 In the new Automator, for instance, you can convert any text passed along by a previous action to an image. 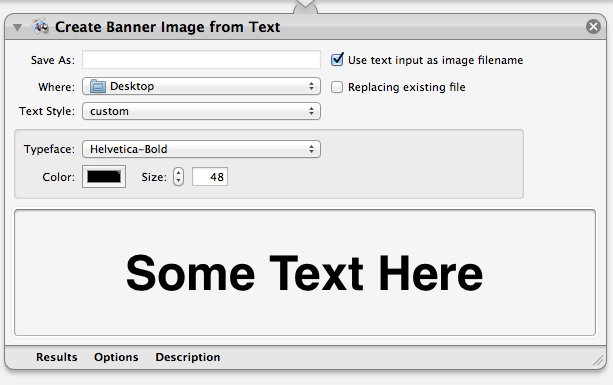 With the new "Create Banner Image from Text" action for Photos, you'll be able to select any text (let's just say you've built a Service, so selection will work anywhere in the Finder or third-party apps) and have it instantly converted to a .png file in a specific location -- with font and color settings specified in Automator. In fact, you can choose from Apple's vast library of built-in fonts to decide how text should look like in the new image, and even specify a color or a size. The utility of this? You can now create Apple-style minimal banners just by writing some text and convert it to an image, or turn that funny tweet into a meme to instantly share on Reddit. Just a few ideas. In more serious scenarios, you can achieve interesting workflows by combining the new Create Banner action with other ones that convert the .png to .jpeg, add it to iPhoto, and sync it to your iPhone. Again, it's really up to your needs when you're playing with Automator, and the additions in Lion only widen the range of possibilities and customization ideas. Another new feature that found its way in Automator for Lion is desktop encoding for audio and video files. That .mov file you'd like to have at 720p on all your iOS devices? Create a simple Automator service that gets files & folders from the Finder, assign it a keyboard shortcut in the Services preferences, and every time you'll end up with, say, .mov files that need a quick conversion, hit your shortcut and Automator -- not a third-party app -- will encode it at 720p, a resolution suitable for the iPad, iPhone 4, iPod touch 4th gen and Apple TV 2nd gen (besides, of course, Macs and PCs). Alternatively, you can encode AIFF, CAFF or WAVE files to MPEG Audio (ACC) format. The audio encoder can be set to High-Quality, iTunes Plus, Apple Lossless or Spoken Podcast, and just like video files there is an option to trash the source file once encoding is done. Automator's new encoding capabilities won't convert just about any file type to iOS-ready video or music, but they provide a great "default" solution that, in most cases, will save you a lot of time that you'd spend searching for and configuring third-party apps otherwise. Generally speaking, the new Automator obviously takes advantage of Lion to lay out Auto-Save, Resume and Versions support so your work will never be lost and workflows will be reverted to a previous edit in case of errors. Furthermore, Apple improved other aspects of the Automator engine: most text-based actions now support RTF (meaning you have more options in the output and input of text files), services and actions can self-install with a double-click on their icons, and workflows can be re-saved to different templates (say a service to an applet). For the Automator geeks, Apple has also improved text filtering (in services that process data detectors text objects, like URLs, there's now an option to pass to the next action the full text or only the found object) and enabled system-wide services for the Terminal. However, my two favorite features in the new Automator are support for fetching web content and EPUB conversion. The latter allows you to create a complete .epub file (an "ebook") starting with files and folders. These .epub files are perfectly suitable for iBooks on iOS, and in fact Apple has made sure this Automator action can support text as input, as well as images, H.264 video, and AAC MPEG audio. Once properly configured (you can set a title, author, cover image, even break down media to one per chapter and scale images to fit), this becomes a powerful tool for independent publishers who are used to keep a rigorous folder structure but have been looking for a utility to quickly turn text files + media into EPUBs. For people like me, it means I can grab any long article off the Internet and, with a bit of patience (e.g. split it into chapters) and organization (choose some images) turn it into a book to read on my iPad. Isn't there Instapaper for that? 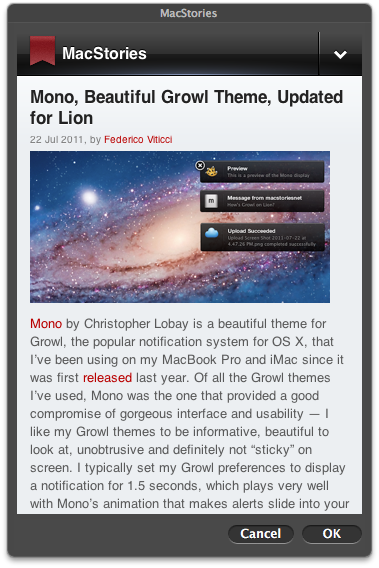 Yes, but for long articles with lots of media (like Siracusa's Lion review), this option may be better. And after all, it's just cool. Last is "display and retrieve web content", which also happened to be covered by Andy Ihnatko at his personal blog today. Basically, Automator can now create desktop web apps off any specified URL, with the possibility to set a size (custom, iPhone size, iPad size) and a user agent. Automator calls these user-created web apps "Website Popups" and indeed they're simply better versions of the old Dashboard's webclip item, only with more controls over the size and kind of the URL you're fetching. Because Website Popup does offer user agent control, it means your web apps will be able to get the mobile versions of websites, which are just about perfect to use as quick visual shortcuts on the desktop. 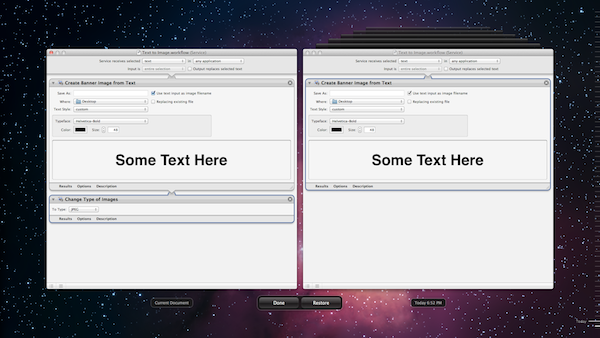 And you can save them as "apps", meaning they'll be available in Lion's Launchpad, too. You can read more about this (and how to do it) over at Andy's blog. The new Automator doesn't look to dissimilar from its predecessor, but just like Lion, it's much improved under the hood.